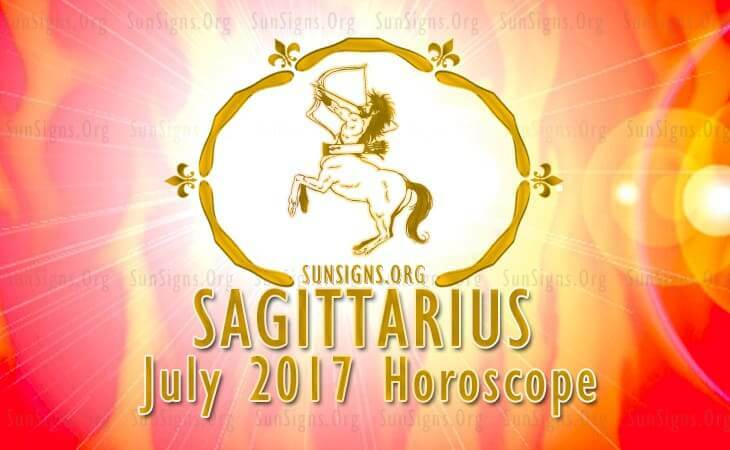 Sagittarius July 2017 Horoscope forecasts that the House of Career will become robust from the 23rd of July. Planetary aspects are not favorable for family and emotional issues for the Sagittarians. Problems concerned with these will linger for some more time. Hence you should lay emphasis on professional life in July 2017. Sagittarius, majority of the planets are located in the Western half of the chart towards the descendant sign. You should allow situations to direct your life and flow with them in the month July 2017. Independence and hard work will not yield the right results. Cooperation and teamwork will be of great assistance. Social grace and adaptability are the needs of the day. Sagittarius, planetary retrogrades may slow down your progress this month in July 2017, but will work out to be advantageous in the long run. Influence of planet Saturn will have positive impact on your health and the finances. You will have no problem in facing the demands of planetary changes in July 2017. The Sagittarius horoscopes for July 2017 suggest that businessmen should concentrate on promoting their products with good marketing strategies. They should try to make use of their social contacts in furthering their businesses. Professionals should put in more effort to advance in their jobs. July 2017 is favorable for friends to achieve their career objectives. Friends in turn will help the career development of the Sagittarius personality. The 2017 astrology forecasts for the Sagittarius born predict that monetary situation will be demanding before the 22nd of July 2017. You will require more effort to earn the same amount of money. You should use this period to reduce your expenses and to clear old loans. Things improve towards the latter part of July 2017 and there will be more enjoyment along with the earnings for the Archers. The 2017 love predictions foretell that love is superb till the 23rd of July 2017. There will be problems due to planetary impacts in the end of July 2017. This will necessitate an assessment of the Sagittarius compatibility in current relationships. You may have to decide on the continuation of the alliance. However this is not the proper time to take major decisions in matters of love, children or pregnancy. Single Sagittarians will not have any problem in finding new love partners. Before the 8th, of July 2017 love is to be found in the vicinity of your home among close friends. After that romance is to be found in religious places, academic environment or overseas with foreigners. After the 27th of July 2017 workplace will be a source of love. Family members and colleagues will also be of help in forming love relationships. The July Sagittarius 2017 horoscopes predict that good health will be essential this month for professional success and may be a requirement for promotions in your job. Health will be wonderful this month and you have the encouragement of family members and the management in your attempts to improve your fitness. Read about Sagittarius fitness. Diet plans based on your sun sign will add to your overall well being in July 2017. The Sagittarius July 2017 horoscope foretells that your career and health will be interlinked this month.